Half-Share Winter rentals run for the entire winter season. (5 months - Mid November through Mid April). Electric, Internet and Heat Utilities are split between the owner and tenant. Owners and tenants occupy the home everyother week. One week the tenants have the home, the following week the owners have the home. Weeks run from Wednesday to Wednesday. Owners leave the home clean for tenants and in return the tenants leave home clean for owners. (game room, hot tub, fitness room, heated indoor pool). Click here to view our Long Term Winter Rental Homes. Please call or email us at (802) 464-2181 or winter@chimneyhill.com for more information on any of these properties. I have a question about the property at 522 28 Lightning Ledge Way Half-Share Wilmington VT 05363 (#HS-522). I would like to schedule a visit for the property at 522 28 Lightning Ledge Way Half-Share Wilmington VT 05363 (#HS-522). Our home, (nick named "Durkee's Do-Drop-Inn") ,was built on a parcel of property that my dear Mother in law and father in law purchased 20 years earlier and never built on (before their passing). We built the home to remember them by. The house is one of a kind. Designed and partially build by myself. I wanted something special in the design, such as: true Vermont style "T" moldings; wood ceilings on all of the main level; open floor plan; limited rustic look; and two story windows. At night you can see so many stars because there is no light pollution here. There is plenty of firewood for the cozy indoor fireplaces as well. Feel free to sit back and relax in our Jacuzzi tube after a long day of hiking, skiing, biking, or snowmobiling. Many visitors also love waking up and seeing fresh foot prints from the local wildlife right off the private back deck. We know you will enjoy your stay here. --Owners *****HOME IS FULLY EQUIPPED EXCEPT FOR SHEETS, PILLOWCASES, TOWELS, SHAMPOO ETC. ***** All rentals through Chimney Hill Rental Management include use and access to all of the Chimney Hill amenities. This includes use of the Chimney Hill Clubhouse. At the Clubhouse, you will find: a fitness room, arcade games, ping pong table, pool table, theater, sitting/reading rooms, BYO Bar, summer BBQ, horseshoe court, kids play area, indoor hot tub, indoor pool, outdoor pool, lighted tennis court, lighted basket ball court, bocce court, and volleyball court. Other amenities include a fishing pond, picnic areas, more tennis courts, skating rink and warming hut, VAST snowmobile trails, and hiking trails. Chimney Hill is located five minutes from downtown Wilmington, ten minutes from The Hermitage, and fifteen minutes from Mount Snow. Rent Includes: Plowing, Rubbish, 1 Cord Firewood, TV, and Clubhouse. Tenant Pays: 1/2 Electric, 1/2 heat, and 1/2 Internet. 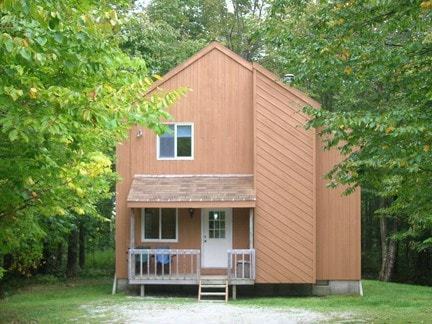 I have a question about the property at 389 8 Bear Lair Lane Wilmington VT 05363 (#HS-389). I would like to schedule a visit for the property at 389 8 Bear Lair Lane Wilmington VT 05363 (#HS-389).